When you see the term "gluten-free" on a food label, it means the food meets the U.S. Food and Drug Administration's legal definition of "gluten-free." This doesn't necessarily mean the food has zero gluten in it—just a very, very small amount. Meanwhile, there's no official or legal definition for the term "no gluten ingredients" on food labels. However, manufacturers generally use the term "no gluten ingredients" when the product in question does not include any gluten-containing ingredients, but hasn't been tested for gluten or may be at risk for gluten cross-contamination due to the way it was processed. Read on for more on what "gluten-free" and "no gluten ingredients" really mean on food labels, and what you should look for on food labels to stay safe if you have celiac disease or non-celiac gluten sensitivity. You might think the official definition of a "gluten-free food" would be "a food that's 100% free of gluten." However, the FDA defines "gluten-free" foods as those containing less than 20 parts per million (ppm) of gluten. No, that's not zero, even though it's still a tiny amount. Some clinicians argue that it's effectively zero, since research has shown that some people with celiac disease can eat foods with up to 10 milligrams of gluten in them per day without experiencing symptoms. (Read more about this here: How Much Gluten Can Make Me Sick?) The FDA considered using "undetectable gluten" as its "gluten-free" standard, but decided that would be too difficult for food manufacturers to meet. Under the FDA's rules, manufacturers legally can label a food "gluten-free" even if that food contains an ingredient that's made from wheat, barley or rye (or a crossbreed from those grains) as long as the ingredient has been processed to remove the gluten down to below that 20 parts per million level. The labels are voluntary, not mandatory — manufacturers that wish to cater to gluten-free consumers can add the labels to their packaging, but they aren't required to do so. The labels don't eliminate the need for us to learn to identify gluten on food labels, either, since the FDA's rules don't requiremanufacturers to disclose gluten-containing ingredients. 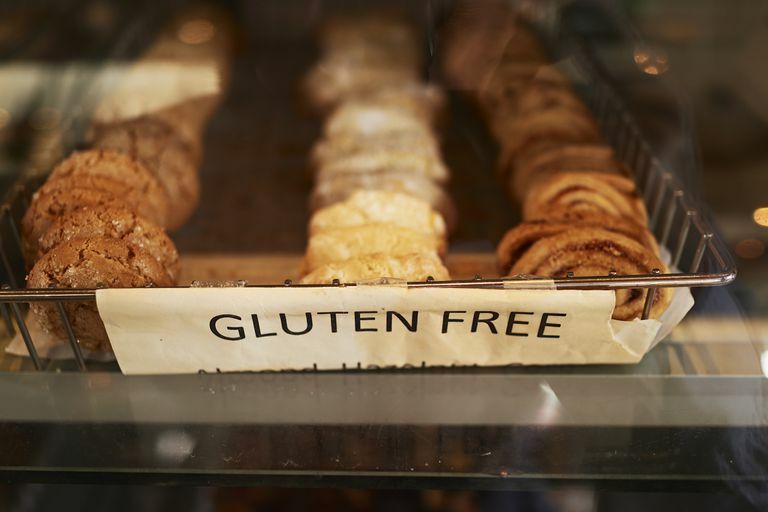 If you're particularly sensitive to trace amounts of gluten, remember that the FDA's definition still allows tiny amounts of gluten in gluten-free foods, which means it's still possible to get gluten symptoms from foods labeled as gluten-free. You're still responsible for knowing your own tolerance and monitoring your own reactions. Adherence to FDA labeling is strictly voluntary and is not subject to ongoing inspections to ensure the regulatory standards are met. With that being said, most studies suggest around 95 percent of manufacturers to comply with the guidelines. If a product is misbranded as being either "gluten-free," "free of gluten," "without gluten," or "gluten-removed," the manufacturer of that product could be subject to harsh regulatory action by the FDA. While that should provide some assurance to consumers, many advocates complain that gluten threshold is not enough. They point to studies that have shown that people with celiac disease can still get sick when eating far less than 20 parts per million, and believe that "gluten-free" should be defined as having an undetectable amount of gluten (meaning that the level is so low as to avoid detection by current testing technologies). Moreover, they argue that there have yet to study ​the effects of gluten in persons with non-celiac gluten sensitivity. If you're particularly sensitive and react to even the tiniest trace of gluten, you need to take more aggressive steps when choosing products. One way to do so is by buying products that are certified gluten-free. Unlike many manufacturers, these companies have voluntarily welcomed inspection of their food by one of three certifying organizations: the Gluten Intolerance Group's Gluten-Free Certification Organization (GFCO), the Allergen Control Group/Canadian Celiac Association (ACG/CCA), and the National Celiac Association (NCA). ACG/CCA requires foods to have less to 20 ppm of gluten, the GFCO requires foods to contain less than 10 ppm of gluten, and the NCA holds manufacturers to a standard of less than 5 ppm. "No gluten ingredients" means just that: the food product doesn't contain gluten ingredients. It does not mean that the food meets the legal definition of "gluten-free." If a manufacturer doesn't want to test a product for gluten, or if that manufacturer is concerned that a product might not consistently meet that FDA standard of 20 parts per million, the company might decide to use the term "no gluten ingredients" instead of "gluten-free." For the consumer, it signals a bit more uncertainty about the gluten-free status of the product. In fact, several companies that produce both gluten-free products and gluten-containing products use the term "no gluten ingredients" for products whose ingredients don't include gluten, but which may be at risk for cross-contamination or aren't tested for gluten. Other companies label their products "no gluten ingredients" as a form of legal protection—the products may actually meet the FDA's "gluten-free" standards, but using the phrase "no gluten ingredients" doesn't promise as much, just in case. Finally, some in the gluten-free community say that foods with no obvious gluten ingredients listed on their labels are safe to eat, especially if the company in question has a policy of clearly labeling any gluten-containing ingredients. However, these products still can contain plenty of gluten from cross-contamination. Are 'No Gluten Ingredients' Foods Safe? Foods labeled "no gluten ingredients" (or which don't appear to contain gluten ingredients) can vary widely in their actual gluten content. Some might actually meet standards for "gluten-free," while others may have a high degree of gluten cross-contamination. For example, a study published in the scientific journal Food Chemistry, looked at 186 foods with no gluten ingredients that were not labeled "gluten-free," and found that nearly 20% of them had gluten levels above the legal level. A total of 10% had gluten levels above 100 parts per million. People do vary widely in their levels of sensitivity to trace gluten. Some people can eat food products made on production lines that are shared with gluten-containing products and not get sick, while others even need to avoid products made in the same facility to avoid getting sick. Before you do buy a product with the "no gluten ingredients" label, take a good look at the ingredients label to see if you spot any so-called allergen disclosures (i.e., a statement like "Made on equipment that also processes wheat"). Companies often will say if a product is made on the same lines or in the same facility as wheat-containing products. If you don't see anything problematic or potentially risky on the product label, you'll need to use your own judgment on whether to consume the product. If you're particularly sensitive, you may want to steer clear, or at least sample just a small amount at first to minimize any potential reaction. If, on the other hand, you rarely have trouble with getting sick from consuming foods with gluten, you might be fine. Food labeling can be confusing, and it's especially confusing for gluten, since three different grains (wheat, barley, and rye) can contain gluten. Federal law requires manufacturers to disclose the presence of wheat (but not the presence of barley or rye) in food products, since wheat is considered one of the eight major food allergies. However, federal law does not require manufacturers to label foods "gluten-free" or "no gluten ingredients." To stay the safest, purchase only food products that are labeled "gluten-free," or foods that are certified gluten-free, and avoid foods that don't appear to have gluten ingredients but that manufacturers aren't calling "gluten-free." And if you have any questions or find yourself getting confused, consider asking your doctor to refer you to a dietitian who can help you navigate the gluten-free diet. Thompson, T. and Simpson, S. A Comparison of Gluten Levels in Labeled Gluten-Free and Certified Gluten-Free Foods Sold in the United States. European Journal of Clinical Nutrition. 2015; 69(1):143-46. U.S. Food and Drug Administration. "'Gluten-Free' Now Means What It Says." Silver Spring, Maryland; issued August 5, 2014. Sharma GM et al.Gluten Detection in Foods Available in the United States – A Market Survey.Food Chemistry.2015 Feb 15;169:120-6. 'Less Than 20 Parts Per Million of Gluten'? What Does That Mean? What Can You Eat When You're Gluten-Free and Dairy-Free? Is Rye a Safe Option for Your Gluten-Free Diet?